PITTSBURG - - At halftime, top-ranked Bishop Carroll found itself in an unfamiliar position, behind. A late second-quarter turnover by the Golden Eagles gave St. Thomas Aquinas a short field and the Saints capitalized on a 1-yard Karter Odermann sneak with 15 seconds in the first half. The Saints carried the 7-6 lead into halftime. It was the first touchdown the Bishop Carroll first-string defense had allowed all season, and it turned out to be the last. Carroll’s defense forced three Aquinas turnovers in the second half and the Eagle offense blitzed the Saints with five second-half touchdowns on their way to a 39-7 victory and the 5A state championship. It marks Bishop Carroll’s third state title in school history and second in the past three years. At halftime, all the momentum was seemingly on the Saints side and the excitement grew after Bishop Carroll went three-and-out on their first possession of the third quarter. Aquinas took over at their own 49-yard line, but Carroll’s defensive end led Jacob Morgan forced a fumble on the first play and Jarrett Johnson recovered for the Golden Eagles. One play later, Carroll regained the lead as quarterback Colton Howell rolled right and threw back left to a wide-open Denzel Goolsby who ran untouched for a 47-yard score. Howell hit tight end Brett Bell on the two-point conversion for a 14-7 lead. Josh Hornback recovered an Aquinas fumble on the first play of the ensuing drive, but Carroll stalled on downs after a dropped pass. Goolsby extended the Eagles’ lead to 20-7 with a 34-yard run in mid-way through the third quarter. After another Aquinas punt, Christian Chalabi deflected Howell’s pass into the air where it appeared to be intercepted by Aquinas’ Parker Swanson. Swanson’s diving attempt was ruled incomplete, however, and Carroll scored shortly after as Howell faked the zone read and hit A.J. Dunmire behind coverage for a 47-yard touchdown pass and a 27-7 lead. Late in the third quarter, Steven Smoll intercepted Odermann and retuned for a touchdown, but a penalty brought the play back. After the quarter switch, Carroll turned the INT into points as Howell hit Goolsby in the flat for a 21-yard touchdown and a 33-7 lead. Goolsby finished with three receptions for 97 yards and two touchdowns on the day. He also rushed for 89 yards and a score and was named the Kpreps Player of the Game. Howell rushed for a game-high 108 yards and two scores. He completed 10 of 22 passes for 188 yards and three touchdowns. He scored the game’s first points early in the first quarter on a 35-yard touchdown run after a short Aquinas punt set up the Eagles at the Saints’ 40. 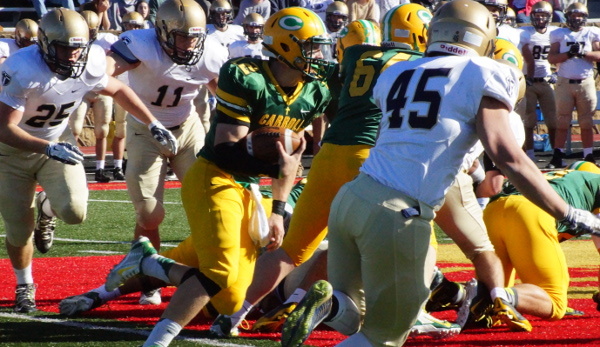 The Bishop Carroll defense held Aquinas to 97 rush yards on 44 attempts. Brendan Hallacy registered nine tackles, including two tackles for loss and a sack for the Golden Eagles. Aquinas was led by their junior quarterback Odermann who rushed for 31 yards and a touchdown on 24 attempts. Odermann also passed for 70 yards on the day. Senior Kyle Bollig led Aquinas with 35 rushing yards on eight carries. Aquinas (9-4) battled through adversity through the postseason to finish as the 5A state runner-up in Randy Dreiling’s first season as head coach. The Saints played without several key players lost to injury including 1,300-yard rusher James Cosentino, running backs Jacob Liekam and Sam Ramaekers, and leading tackler Nick Gadwood.